This client packed up and moved to the City by the Bay for his job and never looked back…except of course to sell his Belltown Condo. Used as a rental income after his departure from Seattle, this condo needed to get sold so he could purchase a place in San Francisco! Do you need to be here to sell your condo? Not at all, we actually never met this client in person, but via phone, email and fax real estate can be done no problem. We coordinated having the condo staged, cleaned, and got it ready for the market. Why? Because that’s what we do, duh! 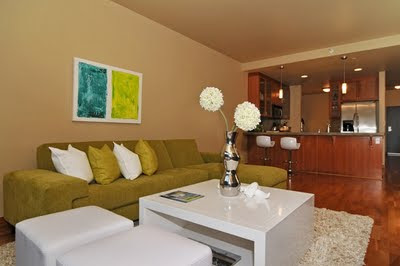 A modern and very large 1054 sq ft condo in the Bellora in Belltown, this condo had it all. Open kitchen and living room, 2 full bathrooms, an in-unit washer dryer, a walk-in closet with California closets, fireplace, gas cooking, parking, and wonderful modern touches this gem was begging to be purchased. And it was! Good luck in San Francisco!